SoundCloud has posted a somber memorial to the Berlin Wall, for the 25th anniversary. The concept is intriguing not only for its content, but also its form. The work uses time as a measurement of space – the duration sound would take to travel the length of the whole wall. In comments on SoundCloud, the 120 people who lost their lives are counted out in their fateful location. See the full description below. I’m curious to hear what readers think; my own preference would have been for an abstract interpretation rather than such literal, figurative sounds, but this is entirely personal. The anniversary of the fall of the wall has in Berlin brought a host of events – including many celebrating the musical renaissance that followed reunification. And it is no exaggeration to say that Berlin has become a world capital of music technology, host to Ableton, Native Instruments, and SoundCloud, but also countless researchers, artists, electronic musicians, and small builders, as a direct result of this historical event. Perhaps against this, it is worth reflecting on the text of Beethoven’s 9th Symphony, the fourth movement “Choral,” which was played yesterday on the anniversary. The text: Johann Christoph Friedrich von Schiller. The original word was not joy, but the more politically-loaded freedom. Given that last night is, somewhat incomprehensibly, both the anniversary of the fall of the wall and the horrific Kristallnacht, in a city that was home to Nazis and the fulcrum of a nuclear standoff with my own native United States that very nearly destroyed humanity and a lot of life on earth, this is the reason we have to make sounds in Berlin or far away from it- we are at a boundary line for humanity. Marking the 25th anniversary of the fall of the Berlin Wall. The Berlin Wall of Sound is an acoustic reconstruction of the Berlin Wall. the tags depict the victims and mark where they were killed. the concrete Berlin Wall were unbearable. attempt to live in freedom. We will not forget. At top: three balloons among thousands staged as public art installation in the Lichtgrenze, a work by Christopher and Marc Bauder. 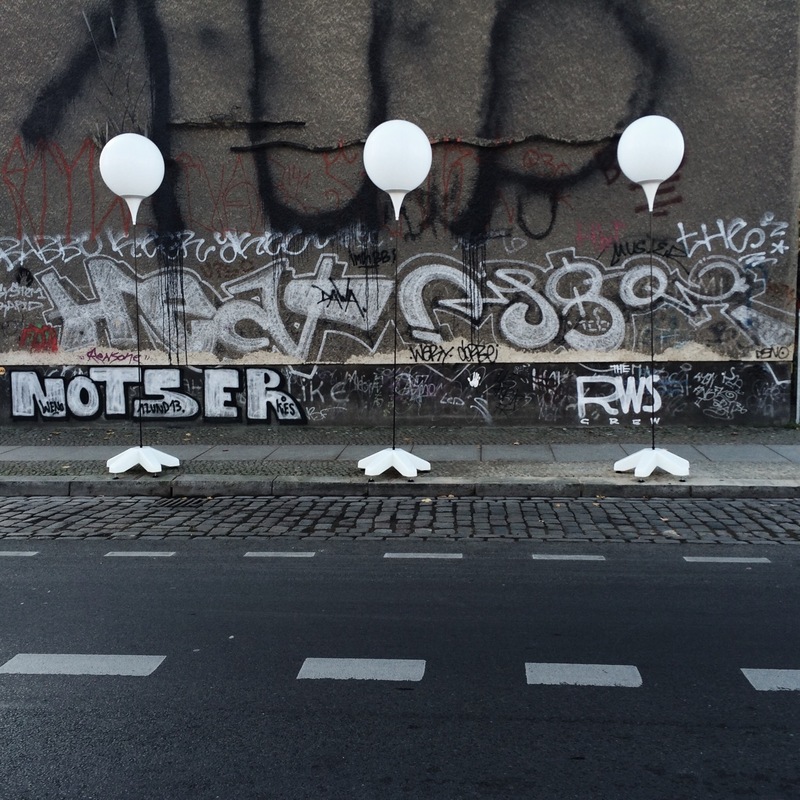 I had the honor of releasing balloon number 1,833 not far from this spot in Kreuzberg.